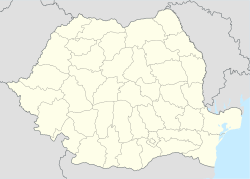 Izvoarele Sucevei (Ukrainian: Ізвори) is a commune located in Suceava County, Romania. It is composed of three villages: Bobeica, Brodina (also called Brodina de Sus) and Izvoarele Sucevei. At the 2011 census, 54.7% of inhabitants were Ukrainians and 45.2% Romanians. At the 2002 census, 73.9% were Eastern Orthodox, 23.2% stated they belonged to another religion, and 2.7% were Seventh-day Adventist. Wikimedia Commons has media related to Izvoarele Sucevei commune, Suceava. This Suceava County location article is a stub. You can help Wikipedia by expanding it. This page was last edited on 8 June 2018, at 14:24 (UTC).